I had two great things come in the mail yesterday. 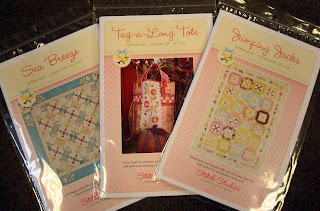 I won a drawing for some Cyndy Walker patterns over on Pam’s blog! Thank you Pam and it’s great to know I have not just a lucky rabbit’s foot, but a lucky rabbit in Binny who picked my name in the drawing! Earlier this year I purchased some Surf and Sand by Michele D'Amore for Marcus Brothers which will work really well on the Sea Breeze pattern! And now I have an opportunity to shop for fabrics for the other two! 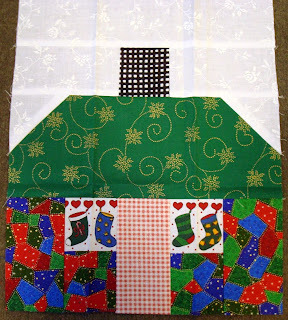 The other package was from Ruthie who sent me another of her Christmas Cottage blocks. Ruthie’s initial block was a little off-size, so she made us all a new block! Well I really liked Ruthie’s first block and have plans for it (shhhh, a surprise)! Her new block is absolutely adorable! Thanks, Ruthie, it’s the little things in life that make it so sweet! Today I am wrestling with what type of flooring to put in the Squash House kitchen and family room. We got a quote on Marmoleum and Cork yesterday, but the cost really threw me for a loop. A few years back we had our condo floors completely changed out - twice the square footage from the area we’re re-doing at the Squash House, yet the price was considerably less. I’m sure part of it is due to inflation, and part due to the materials I chose, but I definitely think we can do better! Have any of you re-done floors lately? Did you find a flooring you absolutely loved - cork, marmoleum, corkoleum, linoleum, bamboo, etc? I would love to hear your comments! I was glad you won that giveaway Candace. Pam is great. I love this new block! Those christmas stockings in the window are so incredibly cute. I know I'd love to have a new floor but that doesn't help, does it? I also know that Ruthie's block is so, so, so cuteamous!!! A Patchworl Angel and A Giveaway! The Elves are Ramping Up!